The Bronx Mental Health Redevelopment project was a much-needed redesign of an aging psychiatric campus built in the early 1950s. The New York State Office of Mental Health (OMH) recently completed the development of the new Bronx Psychiatric Center because its existing campus was begging to be rebuilt after reaching its full lifespan. The OMH project was managed by the Dormitory Authority of the State of New York (DASNY). It was once thought that renovating the old buildings was an option, but eventually it was determined that a new construction project featuring six new buildings was the best way to complete the project. With completely new site characteristics and infrastructure, the project included six major building pieces: 156-bed Adult Behavioral Health Center, the 86-bed NYC Children’s Center – Bronx Campus, a Central Services Building/Central Utilities Plant, and Residential Village, consisting of a 96-bed Transitional Living Residence, a 44-bed Horizon House/Haven House and the 48-bed studio apartments. Counsilman-Hunsaker was the lead aquatics designer for the 800 sq. 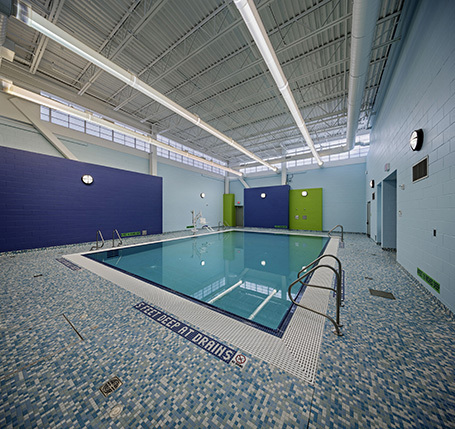 ft., 33 ft. by 23 ft. pool located in the Children’s Center. The campus is aiming for LEED Silver certification. Contributing to that are recycled materials and others with low emissions of volatile organic compounds, as well as the recycling of construction waste, using natural and high-efficiency lighting and installing an HVAC system in a central plant for three of the buildings. Additional energy efficiency is provided by the central plant, which includes a chiller for air conditioning, the heating system and pumps for the fire sprinkler system.